IAM 20 (Integrated Amrita Meditation TechniqueSM) is a powerful tool to alleviate stress while enhancing peace in daily life. It is a simple 20 minute exercise that combines simple yoga and meditation practices, promotes both physical and mental relaxation, is non-denominational (beneficial to people of all faiths) and can be done by anyone, including persons with limited mobility. This class is taught by extensively trained instructors. 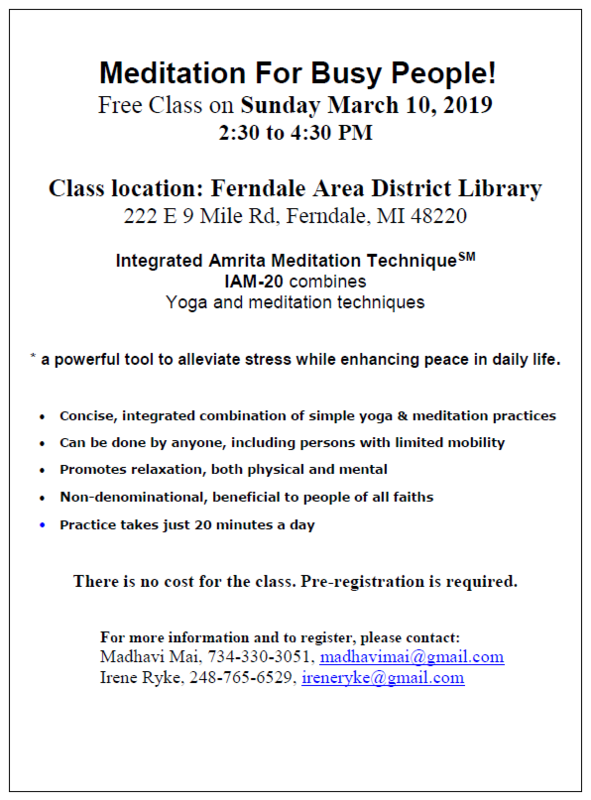 The Ferndale Library is located at 222 E Nine Mile Rd, Ferndale, MI 48220. There is no cost for the class. Pre-registration is required. Please contact Irene Ryke (Nishkama) at 248.765.6529 or Madhavi Mai at 734.330.3051 or click here to register or for more details. Please click here for flyer.